As you are aware from Nigel Hall's recent emails, the J27 was successfully delivered to New Bridge by Friday of last week, in spite of various delays and difficulties. Can I thank everyone who was involved in any way with that move, but particularly Nigel for masterminding the exercise, for all your hard work and contribution to achieve that, in what, I know have been very difficult circumstances. 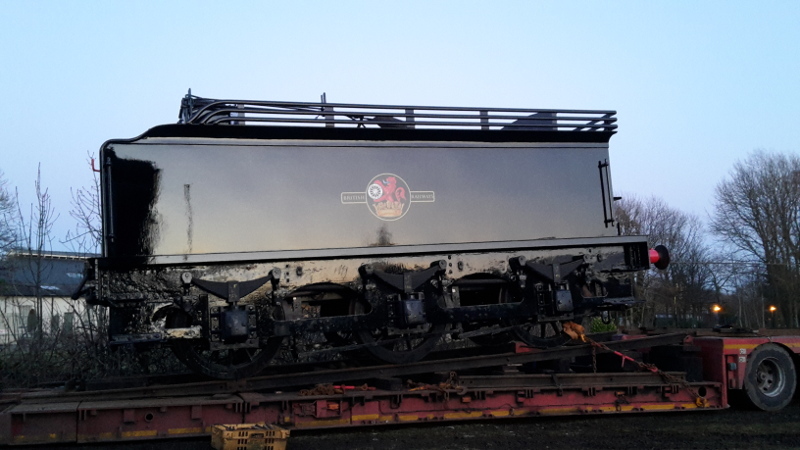 Having got to New Bridge, the engine and tender were coupled up on Friday, and attached is a photograph of the locomotive in the compound at New Bridge. On Sunday, Paul Hutchinson and Angie went down to check over the locomotive and oil round before the move to Grosmont the next day. Everything was fine, but Paul commented that he had forgotten how little room there is to oil up between the frames. Having overcome a last minute problem with one of the signallers who had gone sick, the move to Grosmont went ahead yesterday morning as planned. Chris Cubitt and Charlie Wood were the diesel crew, with Dave Tibet as guard and Paul Hutchinson and Adrian Dennis as fitters travelling on the J27. Paul reports that all went very well with the move. Mechanically it could hardly have been better. Only the left leading side rod bush got any more than cold. There was, however, nothing to worry about at any time and it had completely settled down by the time we got to Grosmont. The cylinder block warmed up a little (to 60 degrees C), but with the large volumes of air being shifted this was not surprising. I tried the at reverser various cut offs and the engine and I agreed that 50% was about right. We stopped regularly to check around and to dose the pistons and valves with lub oil. Speed was limited to around 10mph. We tried it at 15mph for a short while but it quickly became apparent that this was just a little too fast for the front end. The engine and tender rode very well. All of this bodes well for when the engine runs under its own power. Well done to Neal who oversaw much of the work that was tested today. The engine and tender were then split and the tender put into Deviation Shed behind the Q6 tender. The engine is now in the Fabrication Shop for checking over and the start of work. To achieve the necessary space, Hartland has been moved out of Deviation Shed and No 8 road has now been occupied by the No 29 Weltrol from behind the Q6, and Lucie which had been in the Fabrication Shop. Before Paul left, he removed as much of the tender contents as he could, and has put them under the Q6's new small tubes. Only the new steam pipe, the firebars and Nigel's box of 'goodies' remain to be removed, and as soon as that is done - apparently it should take 3 people about 10 minutes - the Railway will coal the tender, fill it up with water and weigh it. Separately, Nigel took the old steam pipe and Terry’s shelf load of cab pipes to Grosmont on Saturday. The copper pipes are on pallets behind the workshop to avoid confusion with Q6 components, and the old steam pipe is up against No 5. 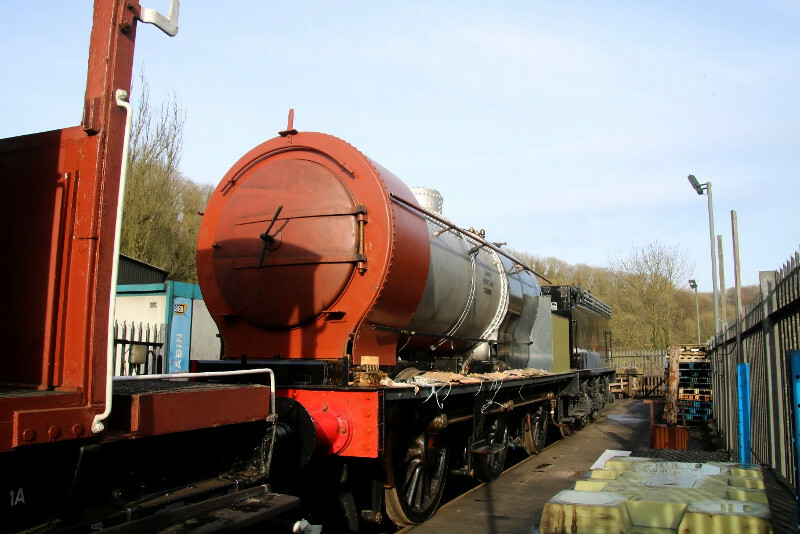 He is planning to bring a van load of the remaining smaller components, mainly in the brass store at Hopetown, to Grosmont on Wednesday, along with the photo album to guide those fitting cab pipework. Separately, I had a meeting with Paul Middleton, Barney Casey, and Kelvin Whitwell at the MPD on the Wednesday (14th) to discuss the project plan for completion of the J27 at Grosmont. Chris Price also happened to be present. Whilst Paul M was still confident that, subject to nothing unexpected arising, the Easter target date for completion was still achievable, in practice he wanted to plan on the basis of completion by the next week, 8 April, to give him both a week's contingency, but also to coincide with the drop from the Easter red timetable to the green timetable for the rest of the month. I was given a firm commitment that, with that proviso, that date would be met. The green timetable would give spare paths for running in and any other test running that was required, which would not be available in the previous week. Subject to that not revealing any problems, then the J27's first service train was scheduled for 8 May - the day after the early May Bank Holiday, although, if all went well, we could see it in service before then. That period in April would also give us the opportunity to 'play' with the locomotive, and we are hoping to arrange some events for the Hopetown volunteers as a way of thanking them for their efforts, in the manner that we would have done at Hopetown if the overhaul had been completed there, but with rather more scope for a greater range of activities. As a result of our discussions, Paul Middleton and Kelvin have produced the attached first draft of the project plan. This is based on their initial understanding of the work that remains to be done, and is therefore subject to revision once they have checked over the engine, in the light of work that is found to have been done at Hopetown and not now needing to be done at Grosmont - for example the valve setting at item 10 has already been completed. I will be reviewing progress against the project plan on a weekly basis, by calling in to the MPD office on a Wednesday when I am down for the regular Q6 working party and will report back accordingly. Any technical issues that arise however, will be referred to Paul Hutchinson, Richard Pearson and John Graham for resolution. In all this, I pointed out the need to make sure that progress with the Q6 was not prejudiced and that it was equally important to ensure that the target date for its completion was also met. Finally, Paul Middleton said he understood the sensitivities of the Hopetown volunteers surrounding the move of the J27 to Grosmont, but any volunteers who wished to continue to help with the overhaul would still be very welcome, although he recognised that, even though the NELPG car would be available from Teesside, this was unlikely to be a practical proposition.